At this writing, no drug therapies for Ebola are in clinical trials, but the Wellcome Trust and other organizations are hoping to mobilize quickly to begin testing effective drug therapies against the world's first ever Ebola epidemic by late November. Earlier this month, we did post on the National Institute of Allergy and Infectious Diseases' (NIAID's) announcement that NIAID and drug company GlaxoSmithKline were launching clinical trials of a vaccine. The Wellcome trials will take place in treatment clinics in West Africa. The unprecedented speed with which the drugs are going into clinical trials reflects the gravity and virulence of the situation. For example, within hours of opening last week, the World Health Organization (WHO) reported that the Island Clinic in Monrovia, Liberia was filled beyond capacity. 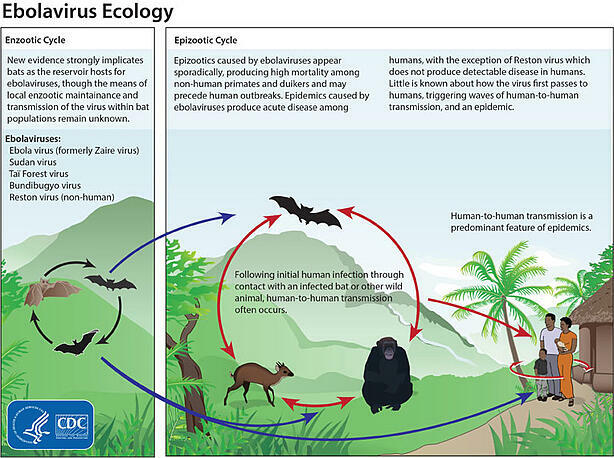 Virus ecology. Image from the CDC. To slow -- and hopefully stop -- the spread of the disease, an expert panel convened by the WHO "...unanimously concluded that in such exceptional circumstances it would be ethical to evaluate unregistered investigational treatments in people with [the] disease." In an NPR story, Dr. Martha Zarway, a general practioner in Liberia who lived through that country's bloody, 14-year civil war, described the epidemic as being more frightening than war. She tells listeners -- and you really should listen to this story -- that during war you can find safety from flying bullets and that you can hug your loved ones for comfort. Ebola doesn't allow for hiding or comfort in the arms of the people you love.